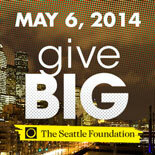 Give BIG with The Seattle Foundation on May 6! Next Tuesday, May 6, is The Seattle Foundation’s GiveBIG Day! Donations made to CELP through The Seattle Foundation’s website today will be stretched thanks to The Seattle Foundation and GiveBIG sponsors. Even better, if you donate through GiveBIG on May 6 you could be randomly selected for a Golden Ticket that wins you a $100 Starbucks gift card and gives CELP an extra $1,000 from The Seattle Foundation & other sponsors. Make a donation on May 6, share with your friends, and be a part of Seattle’s biggest day of giving of the year! Bookmark the site to make your gift online here. Thank you for your continued support of CELP!